Seeing and Disrupting Racism: A Workshop: Tuesday, April 9, 7-9pm ($25 per person, $15 for PJC members) This program was developed for predominantly white audiences because efforts to end racism does not fall solely on those oppressed. In it the group will explore what racism is and why it is often difficult for white communities (and individuals) to see it. It will include going through the concept of white fragility and specific ways to disrupt racism. This event is being hosted as part of a series put together in collaboration with the Montpelier Senior Center, consider join more of these curated events. 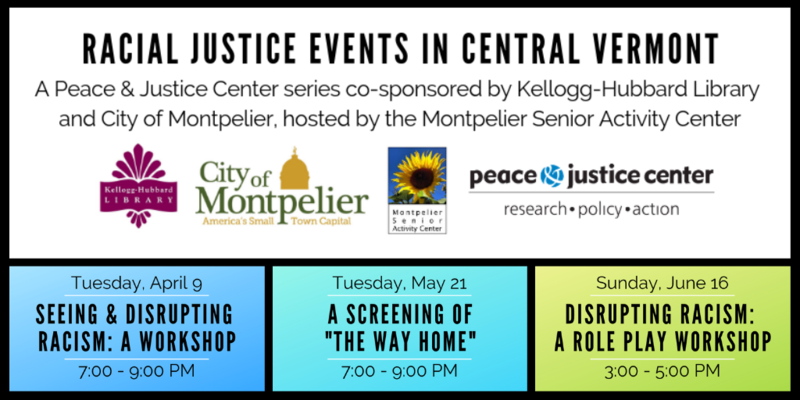 This event is part of a series co-sponsored by the City of Montpelier and Kellogg-Hubbard Library and hosted by the Montpelier Senior Activity Center.